A forlorn piece of land on Main Street just west of City Hall is about to become a construction site for a new $10 million-plus building. It's already boom town on the north side of Main between Bay and Caroline. Now the digging begins on the south side too. On Main Street, just a couple of doors west of City Hall, sits a large empty lot. There hasn't been a building on there - unless you count a used-car sales trailer at the back - for more than half-a-century. Yes, hard times for a long time in downtown Hamilton. But now, finally, that forlorn piece of land is about to become a construction site. Any day now, you will see them digging the foundation for a $10-million-plus building. It's an apartment, and higher end at that. It's been 30 or 40 years since they were doing that kind of project in the core. It's a mid-rise, not a high-rise, seven storeys. So it will be a junior on that stretch of the street. Right across the road, Darko Vranich is finishing off his 15-storey Hilton and starting work on his 12-storey condos at the old federal building. Azim Kassam is not a developer on that scale. "My name is not being mentioned at all, and that is fine," he says. "I'll stay low profile." No picture please. Kassam, 64, arrived from Tanzania in 1981, ran a motel on Lundy's Lane for a few years. Then he moved to Toronto. And six years ago, when there was much talk and little action downtown, Kassam quietly bought an old Ford dealership on Main near Wellington and turned it into a $5.5-million 60-room Days Inn. He still runs it. How's business? "No complaints." And two years ago, he bought the land where Hamilton Motor Products used to sell used cars. HMP tore down the first houses on that stretch of Main in the late 1940s. By 1962, they were all gone. Kassam got the parcel for $1.5 million from Darko Vranich's estranged wife Erika. Kassam planned to build another hotel, but couldn't get the financing. Lenders said there were too many hotels going up already. 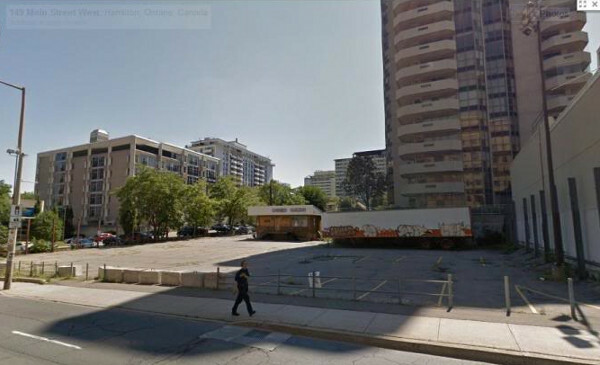 He had made his land purchase conditional on McMaster committing to building their health centre at Main and Bay. Once the university firmed up, he did too. He commissioned a feasibility report that showed the core was ready for new apartments. More people want to live downtown, young professionals to retired boomers. They don't want to be in the suburbs and they don't want to tie up funds in real estate. 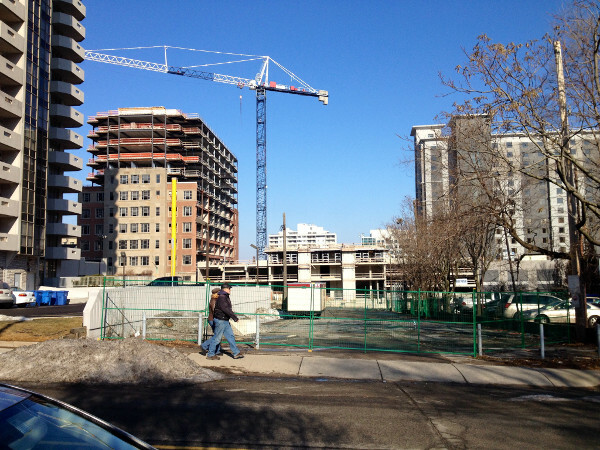 The name of Kassam's project is 149 Main West, with 73 units. Rents will be about $1,100 for a one-bedroom, $1,300 for a two-bedroom. Units will have fridge, stove, dishwasher, with laundry on each floor. The building earns a Walk Score of 95. Some on the SkyscraperPage forum have seen the drawing and been underwhelmed. "That is one boring proposal, too typical," one commenter says. "Hamilton is better than that." Kassam says that's not fair. "I'm not using stucco here. This is brick and stone." Glass too, along the street level, which will be the apartment's lobby, party room and gym. There were hurdles along the way with City Hall. "Like all municipalities," Kassam says. He thinks the process could be better, "and I'd be willing to sit down with city officials and discuss it." Through downtown renewal programs, Kassam qualifies for a grant of about $180,000 and a loan of $2.3 million. He says the project would not have happened without that. He'd like to see a major clean-up of the core for the 2015 Junos and Pan Am Games. And one more boost - two-way traffic on Main Street, past both his properties. "I think it would bring more business and more things to do." Once the foundation on Main West is finished, precast walls start rolling down the highway from Guelph. At the end of next month, the floors are to begin to rise at the rate of one a week. 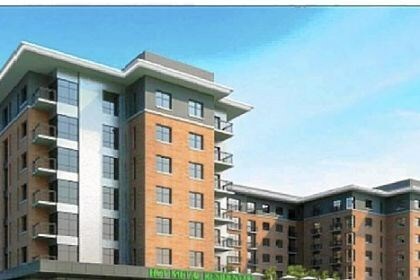 Kassam hopes to have people moving in by September. Great news - this stretch has really turned a corner. Looking forward to seeing more renderings! Nice to see some positive comments. I am dismayed at the critical comments seen here and the linked forum on the design. 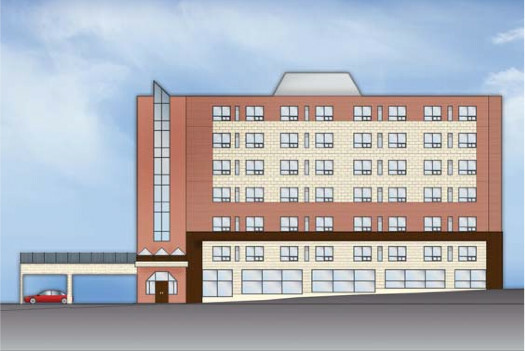 The building will look similar to the student building on the site of the old CNIB in west Hamilton. It's an illustrated design that has been floating around since April of 2013 and I am sure the reality of the building will appeal more to each of you being so critical. Beggars can't be choosers, if they could, they would be developers. I welcome the development and the design. Thank you Kassam. You know what's nice? I can't remember the last time someone used this old saw to dismiss legitimate criticism of any new development in this town, if you can even call a couple of mild remarks about the size of the windows 'criticism'. Hamilton has ranked at or near the top of Canadian cities for real estate investment for several years now, and more and more people are realizing we are not beggars anymore. We have every right to expect would-be developers to bring their A game. ...if they could, they would be developers. How do you know they're not? Lots of people in this city, and a number of the commenters on this site, own buildings that they have invested a great deal of time and money into. They have every right to take pride in their city and expect better from fellow investors. I welcome the development and the design. Thank you Kassam. So do I! And I join you in your appreciation for Mr. Kazzam. I also think it would look nicer if the windows were bigger. It's esthetically a lot more pleasing and comforting than squares, and it conveys a clear sense of scale and proportionality to bystanders. Seriously, don't tell a developer how to do their job. We don't tell you how to do your job. Dude, you couldn't be more wrong. The city is our home. Whether it's blemished by graffiti or a multi-million dollar eyesore, it's wrong in either case and should be questioned. Just because the perpetrator has certain credentials doesn't give him carte blanche. I don't consider that an eyesore. An eyesore was the crumbling asphalt, the old used car office that was covered in graffiti and had been broken into countless times, and the trash accumulating on the lot. Construction in our city is a GOOD THING. I think it looks nice, and applaud the builder for putting it up. I admit I was a bit hyperbolic, but my point is there has to be oversight of some kind. Construction is _potentially_ a good thing and criticism of builders is not necessarily a bad thing. We don't? Something tells me Ryan's inbox is filled with people telling him how to do his job. If your job is in the public realm, face the fact that people are going to tell you how to do it. Frankly it's a positive sign that people care, and feel a sense of ownership over their city. A developer who doesn't like people telling them how to do their job (cough Blanchard cough cough), should get out of the development business. As a society governed by the rule of law, we tell everyone how to do their jobs, to the extent that how an individual does their job has public consequences. Developers produce better projects - for themselves as well as for the public - when sensible, evidence-based laws and regulations govern the manner in which buildings are designed and built. THIS. I've always been amazed at the difference that one small change can make to the look of a building. Yup. And if it's not possible for the glazed area to be more proportional, perhaps there's a way to achieve a similar effect with decorative elements? If it's true that the city's building code is basically enforcing bad design in this manner, then that's incredibly unfortunate. Noise and energy are important, but there has got to be room for compromise. Man, we need a design review committee in this town asap. Great to see Paul Wilson writing for RTH! Hope we see more form him here. Nice to see even more developer/business support for two-way conversion. Why exactly is there so much opposition to two-way conversion from those who are "tired of subsidizing downtown"? It's a safe bet to say that there are people who view downtown and the lower city as nothing more than an expressway, but i'm more inclusive about who they are. Not just people from "the suburbs", but many lower city residents ... they use these roadways to speed thru adjacent areas, etc. It's easy with two-way conversion on Main to place the resistance elsewhere because it is designed to move traffic thru in its current form, but listening at meetings in the North End to complaints about bump-outs and other street design changes, including certain two-way conversions tells me that opposition/resistance to "complete streets" isn't simply external. There are also many residents, myself included, who support the plan, but the same tired arguments against two-way conversion and street design changes on Main, King, Cannon, and so forth are expressed by locals in these forums ... and they care about the neighborhood and downtown. They don't see the problem, however. It has led me to believe with an election coming up that supporters of "complete streets" and urbanism in general need to think carefully and strategically about where the opposition is coming from and not simply lump it together with antipathy and disregard for the lower city from elsewhere in Hamilton. They're people who want nothing to do with downtown other than using it as an expressway. Their fantasy would be to see the entire lower city bulldozed from Dundurn to Centennial. I don't think they actually are tired of subsidizing downtown. I think they like complaining that they are tired of subsidizing downtown. If they were actually tired of it, they wouldn't oppose every single measure to help revitalize it. It seems clear that the opposition to two-way conversion springs mainly from people whose top priority is to drive through the city as fast as possible, leavened with a generous helping of unfounded fear. To the extent that there's an overlap between those people who want to keep lower city streets one-way and those who are "tired of subsidizing downtown", and it's vital to keep making the argument that achieving the latter entails abandoning the former. 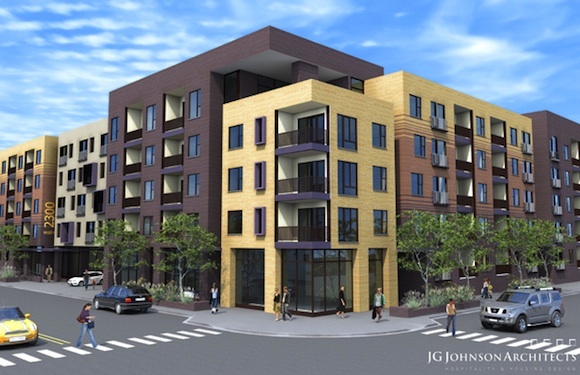 Always nice to see private sector rental development, especially infill. This is great news. 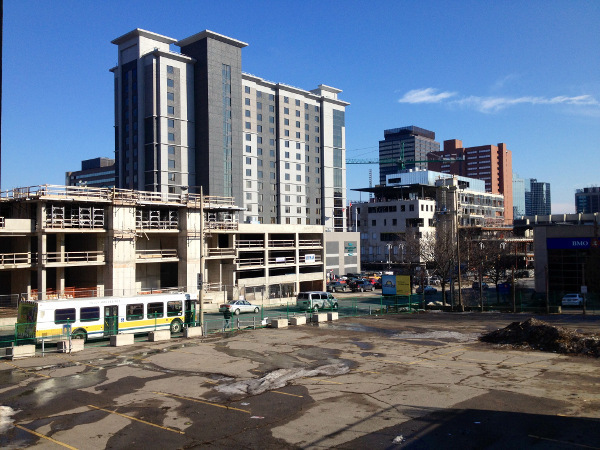 Rental units are needed, and building on parking lots in Hamilton is rare. The design really should be spruced up a little though. I realize this isn't some fancy TO condo, but modest apartments don't need to look quite this bad. Mind you, it could be nicer once more high rez renderings come out. Where Paul Wilson goes, I will follow. Keep those stories fromThe Hammer coming Paul. It's excellent news that there's new infill in that spot. What's less exciting is the dreary mockup of the building. Nice materials, granted, but don't we have enough boxy buildings with too many small windows? Where's the imagination? They look like the buildings near Centre on Barton...small windows, no light. "City housing' anyone? Small windows are actually better for our climate than those glass curtain walls going up in Toronto. Not only to they make heating and cooling the building easier, but glass curtain walls or window walls start to experience deterioration and failure long before standard walls with windows do. P.S. Great to see Paul Wilson writing here! That may be, but they look depressing, inside and out. Surely there's a more aesthetic solution. Like the Piggott building windows. Why is a brick mid-rise depressing? Robert D is right there are a lot of downsides to the glass curtain walls ... nobody knows what all those condos in downtown Toronto will function like in 25 years. They aren't designed to be energy efficient or easy to maintain, and condo fees are already high for most units. Mid-rise brick can be done well ... we just aren't used to it as most of ours were built in the 1960s in the unadorned slab-block style. I was only referring to the size of the windows. I'm quite happy to see a mid-rise brick building going up on that corner. There's a pretty big spectrum between windows that are proportionally too small for the building and a glass curtain. Think of some of the other mid-rise brick apartments in the city such as the ones at Queen and Hess, or the many Art Deco mid-rises with their lovely glazed corners. I'd like to see windows that are more proportional and therefore more aesthetically pleasing, that's all. I agree that glass boxes can be equally banal, and potentially problematic when not done well. Yes, I'm fond of the three and four story apartments built in the 1920s. I had friends in Chicago that lived in an area with lots of them just north of Loyola University. It was a lovely neighbourhood and the rents were affordable ... no elevators in the buildings, though, which made moving difficult. The exterior design could definitely be improved upon, but in principle i like the proposal. I would feel better if Hamilton had a design panel ... even minor changes and recommendations can make a big difference and we have to live with the results. I think the (seniors?) building at King and Pearl nicely demonstrates that a bring apartment buidling with smallish windows can look nice. It uses lots of things to break up the sea of red-brick and makes the building look quite inviting. Mr. Kassam's building seems to attempt that with the big beige rectangle section of the wall, but I think it's fair to say that it fails. Exciting news. DT is really turning a corner. Now if we can just start converting those one-way streets...and I mean real conversions not like the stupidity on York - three lanes going one way and one lane (which nobody uses) going the other. What on earth is council thinking? Not to mention "no turn" restrictions on James that actually make it (almost) impossible to use the one lane going west! I'm pleased to see any development happen in the core.. I would find it astronomical if all the streets went back to the two-way conversion.. I live and work at two different places in opposite directions in the core, and I walk everywhere..
A huge fail with one street is Locke! Really? That one piece between king and main remains one way heading north? Why? In all my 40 years I'm pleased to see these changes, and some of these such as two-way conversion should be happening much more quickly then the pace that it is going.. Way too slow..
On a bright note.. The Delta bingo is closing.. I'm worried that will sit vacant for a while, however I hope the plan that is in mind for this spot will be a wonderful addition to this change.. Closing thought.. glad another parking lot is being filled in! Keep it up Hamilton! small windows because the noise study and energy loss studies would not have been accepted by the City. So.. Our Hamilton is going back to the Juno's.. I think this is a wonderful time for it to do so.. I went to the 1994 and the 1995 Juno Awards using pennies nickels and dimes that had been saved for some unknown reason.. Rolled one night to see what my partner at the time had saved..
Well.. the two of us back in those early nineties living bohemian, living free but broke cashed in those precious coin and were looking for something to do back in the day with that score.. We bought two tickets to the 1994 Juno awards.. We actually let them save for another year to add dinner to that mix.. I'm sure the ticket prices are going to reflect our day today.. but..
What a different Hamilton this has slowly begun... It certainly isn't the same Hamilton it was then.. Then you could get away with a T-shirt over a stripped long sleve! :) Hamilton actually has a real moment to shine in this year of 2015... I really think a new fresh council is needed.. I think Hamilton deserves an opertunity to shine , pollishing up it's slendid glory of the past, and put the word "civic" infront of pride..
Too long has this tired counsil hold our community with apathy, and really Hamilton we are owed so different.. It's time you wake up, and vote new for the future..
Hamilton truly deserves a moment to shine.. Lets look for forward thinkers, someone who just makes those ties that bind..
Great to see proposals for mid rise development in the city. I hope the design has progressed to something less architecturally banal. Brick can be an attractive material when applied thoughtfully. With many beautiful brick houses and factories across the city let's hope the design can develop into something more architecturally engaging. Paul Wilson here ? Does that mean I can delete my bookmark to CBC hamilton, he was the only reason to view that site (Which has become a huge disappointment. Do we really need a supercrawl preview 4 months after the event). The fact he's using brick and not Stucco pleases me. Looks good to me. It's over 5 floors, which is the kind of density I like seeing go up in Hamilton. Would have preferred 10 but you take what you can get. The colour of the brickwork in the rendering for 149 Main Street West and the height of the building seem similar to that of the old federal building across the street. A nice touch. New rendering for 150 Main W looks awesome. Lots of glass, up lighting and large windows. It does look good! Thing about uplighting is that it isn't really ideal. It's aesthetically pleasing but it is basically just light pollution. Interesting article on glass buildings in Toronto: http://www.cbc.ca/toronto/features/condo... Exciting development. Thank you for the link. I will be checking this site daily if Paul Wilson is a regular contributor. Have been looking for his work recently.